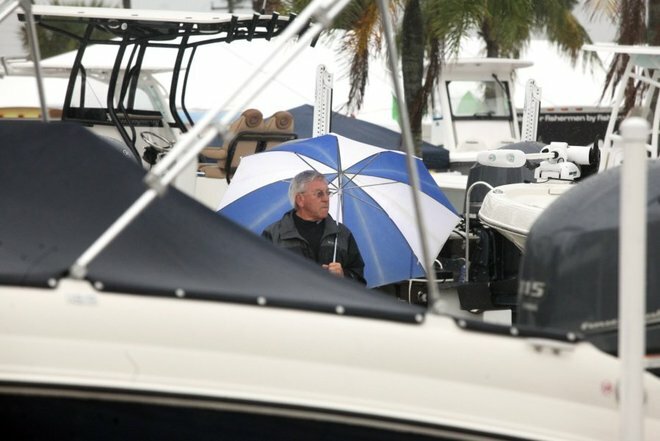 ORIGINALLY FROM TC PALM- JEREMIAH WILSON/SPECIAL TO TREASURE COAST NEWSPAPERS A showgoer takes cover under an umbrella at the 42nd Annual Stuart Boat Show on Friday morning along Dixie Highway north of Old Roosevelt Bridge in Stuart. STUART — The Stuart Boat Show is getting a delayed start. Friday’s opening for the 42nd annual marine expo was marred by a windy and wet frontal boundary that soaked display booths and showered shiny new boats. Unfortunately, but expectedly, the poor weather squelched attendance at the show. Only a few die-hard showgoers made their way through the show’s layout while wearing rain gear and hunkered under umbrellas. Saturday will be a new day at the boat show and exhibitors and organizers are ready to put their best feet forward. “Once the rain stopped, AllSports Productions used its equipment to dry out the boat show site to get everything ready for Saturday and Sunday,” said Janice Aponte, spokesperson for the boat show. Chris Cooke of United Yacht Sales whose brokerage has 12 boats in this year’s show, said boat dealers will be hitting the property early Saturday to chamois their boats dry and prepare them for curious customers. Show officials said despite the weather, no rain checks would be issued for those who did come, but could not enjoy the full experience. April Price, president of the Marine Industries Association of the Treasure Coast (MIATC), said she was happy to hear that the weather forecast for Saturday and Sunday was much better than Friday. She recommended show-goers stop by the MIATC booth located just inside the north entrance to try out the fishing simulator and to test their boating skills on the boating simulator.